Non-default replacement skins for the Sims 3 are here. This is a small program to create the necessary support files and package them with your modified skins, all ready to be put in the game. It will also convert between default and non-default custom skins and allow you to combine or split up skin packages. A couple of sample screens are below. The process is pretty simple: give your new skin a name and decide if it's a non-standard/fantasy skin (like blue or green). If you're using a new color ramp (the color gradient applied over the skin), select it along with the corresponding png thumbnail ramp. Load up the skin files you've modifed. Anything you don't import into Skininator will use the game default. Then click the button to save your new skin package. Since a new skin may involve dozens of files, you can save your project and reopen it later. But where will anyone see my new skin in the game?? Rez Delnava's made the original CAS UI hack which expands the skin tone picker for more tones. Unfortunately Rez's CAS UI mod is NOT COMPATIBLE with the 1.17 game patch which came out when Late Night was released, and later patches/updates. You can still see custom skins by putting your mouse in the box with the skin tone buttons and using the wheel to scroll up and down. 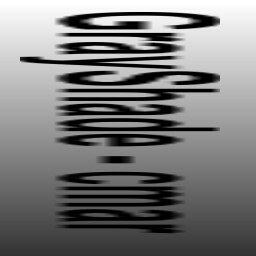 Tip: To make your new skin tone identifiable, add text to the png thumbnail ramp and rotate and stretch it as shown below. If all goes well you'll have that text showing in the color tone slider. A huge amount of the credit for this goes to Rez Delnava. He made the discovery of the function of tone files that made custom non-replacement skins possible, and provided me with much of the data that went into Skininator. Therefore, this tool is officially also known as "Cmar and Rez' Acronymed Poly-Skin Hyper Original Output Tone". When running Skininator on Windows 7 you'll probably find that the file selection buttons stop responding every several files that you select. You'll have to wait for the program to start responding again. This appears to be a problem with the compiler I use to build the application and I'm trying to make the vendor aware of it. With V4.2 of Skininator you should be able to select more files before it happens and the wait time should be less - an improvement but not a complete fix. As noted above, you need Skininator V4 and above to create non-default skins that are compatible with the muscle definition slider. The Skininator does not compress packaged files. Uncompressed packages will work just fine, but for skins it's an issue since image files are very large. If you want to compress your package after it's been created, just open it in s3pe, select the files, right-click and click 'compressed', and save. To install, unzip both files into the same folder and run Skininator.exe. 2/5: Minor cosmetic changes in screens. 2/7: Update to correct a bug causing some skins to have a greenish glow and odd shine and lighting. Many apologies for the inconvenience caused by this! If the 'Help/About' info in Skininator gives the version as 1.01, you have the fixed version. If the same skin file is loaded in more than once (as in scalps, which are all alike), only one copy of the DDS file will be added to the package, and it will be linked multiple times as appropriate. Any combination of the six game skintones and/or up to four custom skintones can be added to one package and will use the same set of skin files. This version was built with an update of FTN95 Fortran with support for Windows 7. Both Skininator.exe and the supporting dll, salflibc.dll, have been updated and should be replaced. Correction to allow creation of tones with a ramp and no skin file. To update, replace both Skininator.exe and salflibc.dll. 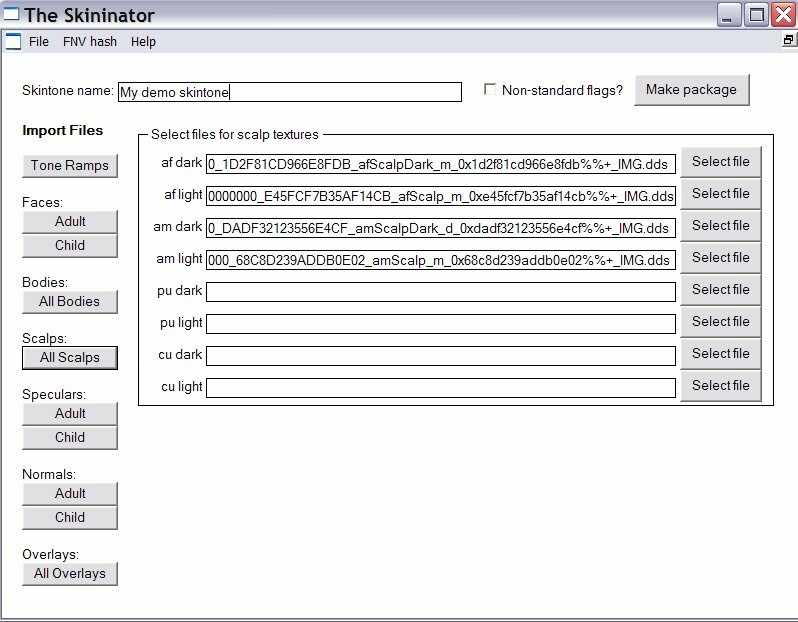 Extractinator is a new function that takes a skin package (default or non-default), extracts the skins from it into a folder, and loads those skins into Skininator in the appropriate slots. Multiple packages can be extracted and loaded in this way, or you can remove textures for any age/gender you don't want to use them for. Then a new package can be created, again either default or non-default. The purpose of Extractinator is to make it easy to combine skintone packages and to convert from default to non-default and vice-versa. Please remember to respect the skin creators - use this to tailor skins to your own personal taste, but don't mix and match skins and upload the result without permission unless the original creator's policy allows it, and certainly not without credit. Compatibility with the new format of skin TONE files introduced in the 1.17 patch that came out with Late Night. Extractinator will now read the name of a non-default skin set. As of game patch 1.17 which came out with the release of Late Night, the format of the skin definition (TONE) files was changed. Old-format skins will work, but the new muscle definition and cleavage sliders will not work with them. If your favorite non-default skin has not been updated to the new format, you can convert it yourself. 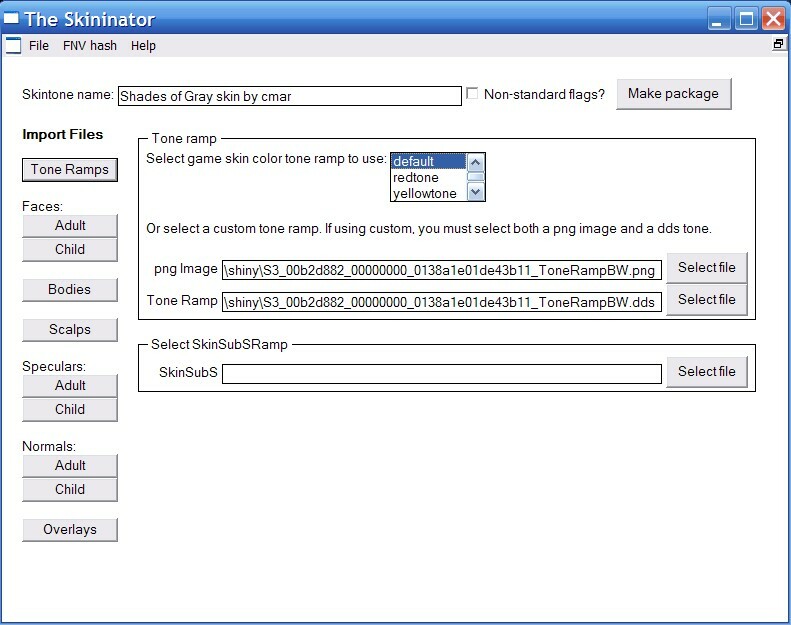 You can extract the TONE file(s) from the package and use Skininator's TONE edit function to open it and save in the new format, then import it back to the package. Bugfix - using Extractinator and rebuilding for the new format did not work properly with packages made with the first version of Skininator. The Instance number would change and the game would see it as a new skin. With V4.1 this behavior has been corrected and the original Instance is retained as long as the user doesn't change the skin name or the tone tags. The problem of the program repeatedly hanging while selecting files on Windows 7 should be better in this version. It's not fixed completely - you should be able to select about twice as many files before it freezes, and freeze time should be shorter. I also added an icon. I'd appreciate feedback on how this performs from other Windows 7 users. The 'Edit TONE' function now includes adjustments for what I call 'shine focus'. In the TONE edit window, at the top are the shine/reflections adjusters I used to make very shiny metallic skins. There's a set of numbers for five areas of the skin tone slider: Light, Medium Light, Medium, Medium Dark, and Dark. The B, G, and R numbers adjust shine for blue, green, and red - higher numbers for more shine, the range is 0-255. The Focus adjusters control the blending of the shine - from a two-toned/metallic effect (low numbers) to a plastic/wet effect (high numbers). The range is 0.0 - 99.0, you can use fractions, the normal number is 4.0. To use these adjusters, extract a TONE file from your skin package, use the Edit TONE function to modify it, and import it back to your package. 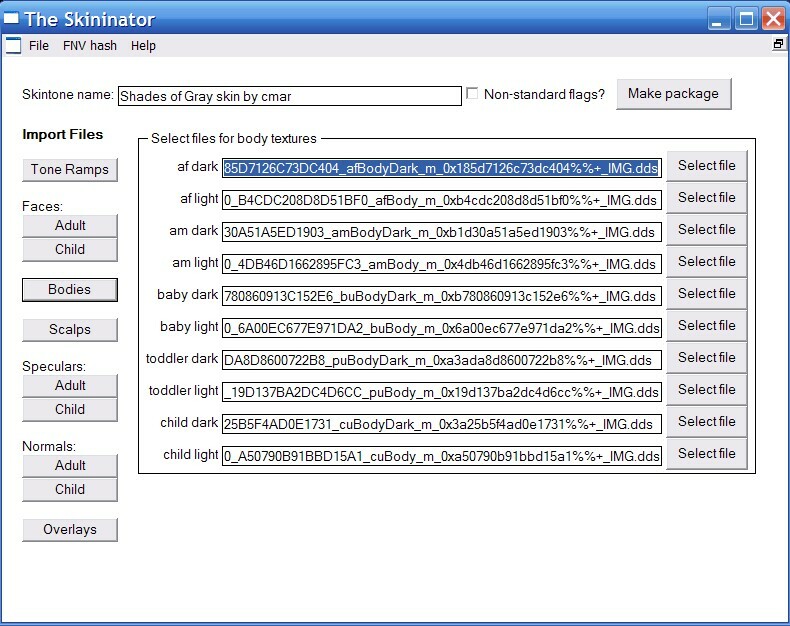 This is a completely new version of Skininator written with .NET 3.5. The interface is overhauled, and the capabilities are expanded. The slow startup and the file browsing delays under Windows 7 are gone. THIS SHOULD STILL BE CONSIDERED A BETA. Please report any problems. Textures are organized by age/gender instead of body area (body, face, scalp). Overlays can be added to the face and scalp as well as the body. This should mean custom skins can have custom eye-whites and teeth, and any other features suitable for an overlay. EA tone ramps have been expanded to include the 1.38 (Supernatural) tones and the 1.42 (Seasons) alien tone. There is no more saving of projects. Since a skintone package can be created and reopened later, the package essentially is the project. Basic non-default - the EA setup, with unisex textures for babies, toddlers, and children; and with teens using the YA faces and teens to elders using the adult bodies and scalps. Advanced non-default - a full set of separate textures for all ages and genders. Default replacement - default replacements for the EA textures. You can load up a package/import textures and then change modes to convert from default to non-default and vice-versa. You can also open and convert old-format skintone packages. There are two options for saving and two for Save As. The Compact option will eliminate duplicate textures - like if you use the same texture for males and females or for all the scalps or for adult and elder faces, or whatever. When you do a compact save the package will automatically be closed. If you need to work with it again you'll have to open it and the textures will automatically be duplicated to all the places where they're being used. To install, extract the files to a folder and run Skininator.exe. 1/10/2013 - 7:00pm EST - Uploaded corrected version of V5. If you get an error that squishinterface_Win32.dll or squishinterface_x64.dll is missing, please re-download. 12/10/2013 - Uploaded a new set of game skintone/skin ramp files including Supernatural and the second Alien tones. 1320 people have said thanks to CmarNYC for this download.